After lots of outstanding speeches and some wonderful democratic voting, our School Council Representatives for 2017-2018 have been chosen! There are lots of plans to keep our School Council busy this year, especially working with the Southport Learning Partnership (SLP). 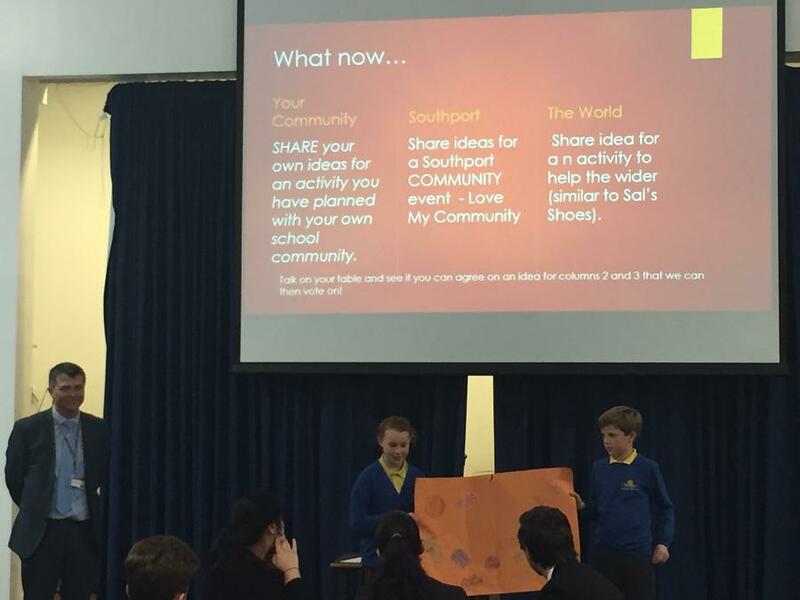 The SLP is all the Southport schools working together on lots of different projects. Our first School Council meeting will be on Friday 6th October. Our representative will be meeting with Miss Butler and Miss Pierce to come up with some ideas to help everyone in school remember our School Rules and our 'You've Been Spotted' reward! We will post some pictures of what we come up with very soon. Our first order of business has already found us in Bedford Park! We spent the morning working alongside Southport Rotary Club, planting bulbs in the park, all ready for spring, to improve the environment for all who use this park. We had so much fun! Today we had our first School Council meeting! As part of the Southport Learning Partnership, we had to come up with several ideas for community events throughout the coming academic year. The first thing we planned was a School Community Event which will take place early in the Spring term. We are going to hold a 'Grandparent's Day' and invite grandparents, great-grandparents and people from our community to school to see some of the things we do each day and enjoy a fun afternoon together. We also came up with some ideas for our 'Local Community' and 'Global Community' events and we will be sharing these ideas with other school councils in Southport at a meeting after half term! Angus and Mia went with Miss Pierce and Miss Butler to our first SLP School Council meeting at Birkdale High. Representative from all the councils within the SLP were there and Angus and Mia had to stand up and present our ideas for our school event! Everyone loved the idea and Mr Antell said he thought it would be a great success! Angus and Mia then shared our ideas for the community and global events with the representatives from Merefield School and they told us some of the ideas they had come up with. We decided on final ideas as a group and then submitted these for a council vote! After everyone had voted, it was decided that our community event would be 'Wacky Hair Day' to raise awareness and money to support Southport Alzheimer's Society. Our Global event will be 'Mary's Meals' which raises money to provide children in poorer areas of the world with school meals. We will keep you updated as to how we will run these events within Birkdale Primary in the Spring and Summer terms! The School Council held their first event of 2018 - Grandparent's Day! So many friends of Birkdale Primary came along for the afternoon to spend time with children throughout the school and get a little glimpse of what we do at school. Everyone had a great afternoon and we're hoping to hold a similar event in the summer term. Thank you so much to everyone who came along and supported the event. Today was Wacky Hair Day! We were absolutely amazed by the wackiness throughout the school! It was a wonderful day that raised awareness and lots of money for a wonderful cause, the Alzheimer's Society. Layla and Leon went to Birkdale High to meet a representative from the charity and take a group photograph of all the SLP schools that made the day possible. Thank you to everyone who contributed to the day.